Injustice 2 review: "Written, voiced, and rendered to an exceptional level, immersing you into the DC world"
Injustice 2 is like your favorite deli sandwich: everything you know you like, with no surprises. It is precisely what your brain imagines when I say "2D fighting game starring DC Comics characters, made by the developer of Mortal Kombat." This doesn't mean Injustice 2 is bad or boring, mind you. 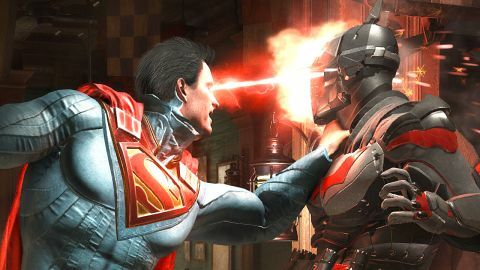 A sequel to the 2009 original (which depicted a world in which Superman became a global dictator) Injustice 2 is building onto an already excellent foundation. To go back to the deli sandwich simile: it's like the sandwich artist behind the counter has been getting better at blending your selection of ingredients just right so that it tastes better than ever before. Injustice 2's controls demand precision, but aren't quite so mechanical as, say, Street Fighter 5. Everyone from pro to noobie should be able to figure out a few combos and feel like they have a decent handle on their fighter of choice. Of course, you'll know when you've come up against someone who knows what they're doing - but if you've never played a fighting game in your life it's still accessible. Every fighter feels unique, an impressive achievement given the roster's size and inclusion of characters who seem similar at first blush, ie. a Red Lantern and a Green Lantern, Catwoman and Cheetah. Whether you like to zone, rushdown, or just button mash because you're not sure what those two words mean, there's someone to fit your playstyle. Really, there's not much difference to Injustice 2 from the first game. There are now more ways to use your super meter - where before this special mechanic let you unleash a devastating super attack or "clash" with your opponent, now you're able to alter special attacks, and perform escape moves and closing moves. The Super moves - stylish cutscenes of serious damage raining down on your enemies that cannot be interrupted - are bigger and more dramatic this time around as well. My personal favorite involves Supergirl punching her opponent into space, dragging them around the sun, throwing them into an asteroid field, and then using her laser sight to blow up the bad guy and the asteroid, sending them all burning back to Earth. It's glorious overkill and just plain fun to watch. In fact, if there's one thing Injustice 2 absolutely nails, it's presentation. The story, centered on DC mega-villain Brainiac, is surprisingly well-written. The twists and turns are unsurprising, but it serves its purpose, and almost every character gets a chance to shine... even if Harley steals the show. The facial animation is downright uncanny at times, and you'll constantly be amazed at the level of detail that went into the story mode of a fighting game. Everything is written, voiced, and rendered to an exceptional level, immersing you into the DC world, even if you're not familiar. Heroes and villains begin fights by acknowledging each other in-character, a behavior they also bring up in the aforementioned "clash" moments. The game's menu is presented as if it were part of Batman's computer. Tournaments and special challenges aren't seen as an arcade mode, but an ever-changing Multiverse. Speaking of the Multiverse, NetherRealm has cooked up some devious challenges in this mode, making players tackle fights against enemies with regenerating health, or fights where you can summon assistance from other characters, or fights where the ground is as slippery as ice, and so on. These special battles are only available for limited amounts of time, so it pays to keep checking in and play Injustice 2 every day. You'll be rewarded with fun new tests of skill and credits to spend on loot boxes. Yes, there are loot boxes. And it's because the rest of the game feels so meticulously realized that the new gear system underwhelms. Theoretically this new system, which lets you buy loot boxes with credits or earn them as you earn XP, would allow you to change not only a fighter's appearance, but their stats - allowing you to further customize your favorite champion. The reality is that acquiring gear often feels like a crapshoot at best and a torturous grind at worst. See, regardless of what you level up or how, loot boxes and rewards are always random. You'll level up Swamp Thing but receive a Batman cowl as a reward. Or better yet, three cowls. Because you can acquire multiple copies of the same gear, many of them with no significant stat differences and/or many of them are restricted until you reach a certain level, the system feels overstuffed and frustrating. In short, the sense of elation at getting a good piece of gear you can immediately equip does not outweigh the long wait and disappointment felt toward every piece of junk that came before. And the icon preview doesn't even show you what they look like, so you have to try on the junk to see if you prefer its aesthetic. What should feel like an exciting part of player progress instead comes across as tedious busywork. The silver lining is that because of Injustice 2's matchmaking and variable difficulty levels, gear really doesn't feel like a necessary timesink. I beat a clearly better-outfitted Supergirl with a default Wonder Woman online, and I'm really not that good. Still, I wish this new feature had been better integrated. Injustice 2 may not be revolutionary and what new things it tries may be underwhelming, but you didn't come to this game for the new or to try something different. You came to Injustice 2 looking for further refinement of the first game's supremely satisfying controls and the focus on presentation that you've come to expect from NetherRealm; you know what you want, and what you want is exactly what you're going to get.